Come meet our knowledgeable staff! With over thirty years experience, Brian and Judy are the preeminent fish care experts in the Milwaukee area. 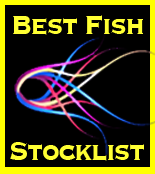 Their goal is to carry the most complete line of fish care items at the BEST prices with the BEST service. After a four year break, we are excited to be back! We look forward to seeing you again!